Manchester Piccadilly station’s crowded platforms 13 and 14 have been the focus of new Transport Focus research. Transport Focus researchers have been out and about to ask passengers about their experience using platforms 13 and 14, using the feedback to help Network Rail and the train companies improve the experience for passengers. Why research about platforms 13 and 14? These are very busy platforms, more passengers use them each day than use Newcastle station, with trains to destinations around Greater Manchester and as far afield as Glasgow and Norwich. Plans were drawn up to build two more platforms, 15 and 16, but it’s unclear when, if ever, this major project might happen. During disruption, delays can mount up here and these two platforms become ever more crowded. This was one of the key locations for severe disruption during the May timetable changes in 2018. Last year new information screens were installed in the waiting lounge above the platforms to give passengers confidence to wait there rather than on the crowded platforms. Knowing the importance of reliable information to passengers, Transport Focus took the opportunity to test passengers’ reactions and understand their views of the current layout on the platforms. Passengers told us the platforms are not a comfortable place to wait for a train, they are often crowded, and passengers report it can be ‘bleak’ with little shelter from the wind and limited seating. There was some recognition from passengers that the lack of space on the platforms is a constraint on improvements, but more shelter is desired. Passengers tended to understand that the shouted instructions from staff about where to stand on the platform are intended to manage crowding and keep them safe, but some say waiting on the platforms can be an ‘edgy’ experience. Clearer information about where best to wait for each part of the train and more staff support would help. Passengers have a wide range of reactions to the new information screens in the upstairs waiting lounge. Some respond negatively or with indifference, others are generally positive about the efforts to provide additional information. 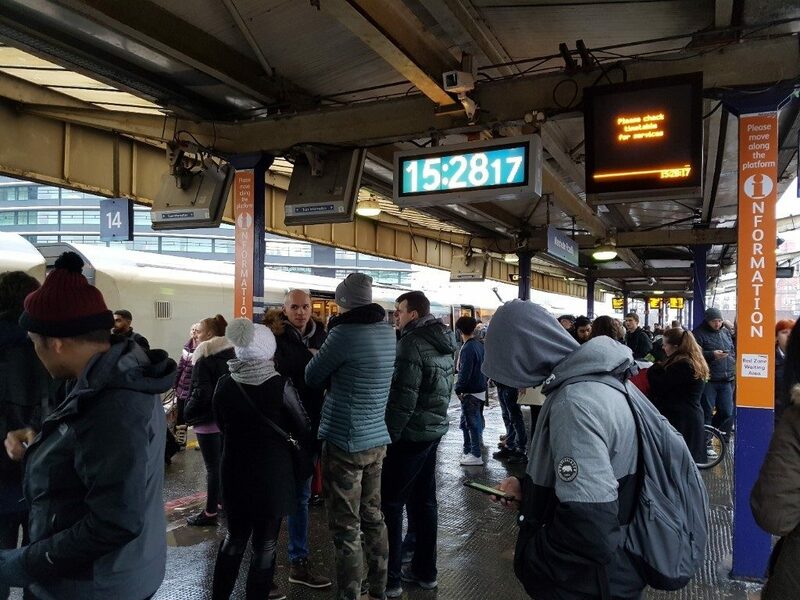 Regular passengers are more likely to understand the intention behind the screens of helping passengers avoid the crowded platforms until their train is due. However, the screens can be completely overlooked by some passengers. Design changes, for example increasing the text size and using more familiar railway information colours might increase their impact by giving passengers greater confidence to rely on the information and wait upstairs. respond to the detailed passenger feedback on the new information screens in the waiting lounge to increase passengers’ awareness and trust in the information. Network Rail have already begun a trial of temporary wind breaks to provide more shelter for passengers on the platforms. Transport Focus will continue to work with the industry to help it use the detailed findings to improve the passenger experience.